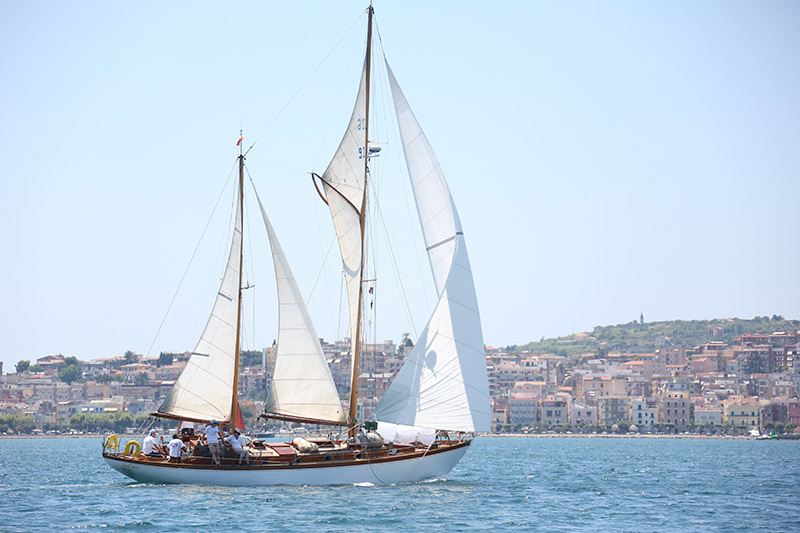 My boat “Rose Joan” was launched in 1949, built by Abeking & Rasmussen ( the leading German shipyard for yachts at that time), designed by Heinrich Rasmussen, very typical of the best features for ocean racing in the years 1936/38. The design survived the war and was the first large unit built by the shipyard after the second world war. First owner was a frenchman called “Jean” (Joan in french Britanny language) and his wife was “Rose”… So, the boat has a French flag since the origin. After a couple of years, he sold the boat to Mr. Fievet, owner and president of “fromageries Bel”, (you may know in Spain “Bonbel”, “Babybel”, “La vache qui rit”, etc). The boat is in the Hauvette family since 1962. Between many guest, the most noticeable is the “Luis, Prince of Bavaria” (Ludwig, Prinz von Bayern), who sailed with us the spanish coast in 1979 (from Toulon up to Almeria and even Melilla in north Africa, and back, via the Balearic islands). The most important feature of the boat is its “Whishbone rig” (see picture), a rig which was made fashionable in the late thirties by the British naval architect “Uffa Fox” (the inventor of the light displacement planing boat). The whisbone is now completely forgotten for ocean sailing boats, but has become very popular for surfing boards…From the around fifty boats originally build in Europe with a Whisbone rig (same in USA), I think only three of them are surviving with their original rig, one in North Germany, one in Spain and one in France.